I remember meeting a woman socially who explained that she’d taken on ‘positive thinking’. She would wake in the morning and mentally run through a positive mantra three times. She had stuck post-it reminders around her apartment and was choosing to socialise with positive people. She was warm, engaging and intelligent and I was curious to know more of her experience. I asked what had started her on this and she explained that a couple of months back her partner had left her for someone else and she’d lost her job in the same week. “God that’s awful” I said. And she burst into tears. It was as though she’d been trying to use a flimsy veil of positivity to cover a gaping wound – a wound that needed attention. Using so much effort to override her pain must have been exhausting and was never going to be an effective solution. Positive thinking does not generally reduce stress, stop panic attacks or solve anxiety. While it may work to some degree as a bandaid or a distraction it is certainly not the answer to stress. Positive thinking is like telling yourself to ‘cheer up’, when what you really need is a good cry or rant. You know those times when you’ve felt like crap and someone has said to you, “She’ll be right mate… glass half full!” And you wanted to scream or deck them. Positive thinking does nothing to actually address the way you feel when things are rough. At best it may act as a safety pin to help hold yourself together for a bit. But it can also add significant strain to the stress you are already experiencing. When I did a quick search on the positive thinking movement the first site I came to quoted the US Declaration of Independence, claiming that it says that happiness is a right. The declaration doesn’t say that – it is the ‘pursuit of happiness’ that is mentioned. This mistake highlights the problem here. It seems common these days to believe that happiness is a right. We must fight for it. We must be happy. There is enormous pressure to be happy. It follows that we think there is something wrong with us if we are not happy. Rather than recognising the challenges and crises that befall us, people can come to blame themselves for their inability to be always happy. Sadness is then accompanied by shame and low self-esteem. Also with this belief system, a crisis is sometimes experienced as a great injustice, and anger, even fierce rage, arises along with any unhappiness. This demonising of so-called ‘negative’ thoughts and feelings has us desperate to try anything to eliminate pain or discomfort of any kind. A striking example –A few years back I had two separate calls within a week from young men inquiring about counselling. They had both recently been “dumped” by their girlfriends. As a consequence, both had begun taking antidepressants. When they called about counselling, they had similar concerns of ‘not knowing what’s wrong with me’ and ‘wanting to feel normal again’. Yet, none of what they described in their reactions sounded unusual or extreme. What they were experiencing was most likely normal symptoms of grief. Why shouldn’t they be unhappy, their girlfriends just dumped them? Their pain is normal in this situation. I felt incredibly sad for both of them, and for us all – less for the pain we endure with a breakup and more for the fact that we seem not to accept that this kind of hurt is normal, rather that it means there is something wrong with us. If not positive thinking, then what? Certainly in this situation (if they have allowed themselves to grieve), looking to the future with a positive perspective would be helpful. The challenge in essence is to be able to respond helpfully to inevitable, tough times and the difficult thoughts and feelings they trigger – to deal with these and not suppress them. Neither to deny them with positive thinking, nor numb them with destructive substances or behaviour. The best way to resolve, quell or make peace with negative feelings (and accompanying thoughts) is to acknowledge them, have them validated and understood. When we do, we are able to either address them or make conscious changes to our situation or mindset. Or it may be the case that we simply come to terms with difficult times. A sense of acceptance and hope can emerge and uncomfortable or painful feelings eventually dissipate. As a result, we may well feel positive which is terrific, because it will be authentic! Blindly grasping at Positive thinking at the first sign of discomfort is not the same thing. To do so is to deny or ignore it. When you continue to walk despite a pain in your foot, you may later feel pain in your knee or hip, so too with negative feelings – Override them and they will catch up with you in some form at some time. Instead, take a Mindful approach, where you pay attention to your thoughts and feelings in the present moment. In time and with practice, instead of experiencing overwhelming negative reactions, we can learn to respond helpfully to whatever arises. Try the following exercise, even just for a couple of minutes, whether you are feeling good or bad. Don’t engage, analyse or try to influence your thinking. Just pay attention to what is going on for you in the present moment. Starting with being aware of sensations is easiest – e.g. tension in your throat, throbbing at your temples, a cool breeze on your skin or the pressure of your back on the seat. You may notice discomfort somewhere, physically or emotionally. Acknowledge it and appraise it. You may conclude that there’s a nagging pain in your back or that you’re in an irritable mood. See if you’re able to hold off reacting to it – neither beat yourself up over it, nor worry about the consequences. Just observe. Thoughts will of course come to mind and they may well be of a negative variety. It’s tricky at first but try not to engage them. Honour them by acknowledging them but for now just let them be, without refuting or supporting them. Thoughts are not facts. Don’t fall for them as some higher truth – if we do they can unduly affect how we feel. Just notice the thoughts as they come and then let them go again. Taking this approach is not easy and it generally requires practice. Many who are committed to Mindfulness will practice meditation formally for 45 minutes daily, or more. Don’t be put off. Even just dabbling with this approach for a few minutes a day can have a profound effect. Try it in the lift, on the bus, waiting for your coffee…and then try it after feuding with your boss or having a shocking day. ‘Noticing’, as described above, activates the pre-frontal cortex – the so-called ‘brain’s brain’. This is the part of your brain that gets sidelined when your stress response kicks in and your body is thrown into fight/flight mode. Adopting a Mindful approach can help to bring the pre-frontal cortex back online and to switch out of fight/flight mode. Furthermore, practicing the approach regularly can help with managing the ups and downs of your emotions. It can decrease our reactivity and improve our capacity to recover from emotional hits. 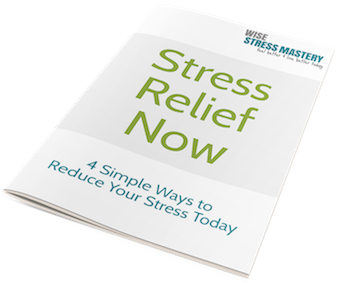 So, stress is less often and less acutely triggered, and when it is, we recover more quickly and effectively. Being mindful is not about avoiding or masking negative thoughts or feelings, it is about being able to deal with them better. Mindfulness may not promise happiness but it can better equip us in our pursuit of happiness. Not only will we be more likely to achieve what happiness is available to us, we’ll be sure to notice it and feel it when we do! Ironically, this 3-minute clip illustrates the point and brings a smile to your face.